Chicago’s new black mayor will be measured for her efforts to help the city’s African-American communities thrive in the wake of a mass exodus due to disinvestment, lack of affordable housing, school and mental health center closings, overpolicing, mass incarceration, unfair taxes and discriminatory traffic fees. Chicago’s world-famous blues music can be a powerful cultural symbol to encourage appreciation of African-American culture. Blues is the root of American popular music including jazz, R&B, soul, rock, country and hip hop. People from all over the world recognize blues and soul music and are looking for it here. Chicago is losing millions of dollars for its failure to promote the blues, Crain’s reported in 2017. The situation is urgent; we have lost many talented blues men and women to age and illness over the past 10 years. Under-employment and lack of recognition have hurt them. But with support, today’s gifted cadre of baby-boom artists can regroup and pass on the tradition from people like Larry Taylor, heritage blues singer, band leader and drummer. Taylor has worked with West Side political leaders Ike Carothers, Congressman Danny Davis and state Rep. La Shawn Ford and nonprofits such as BUILD Chicago to bring blues into parks for people of all ages. Our efforts have been limited by anti-black, anti-blues business and political conditions in the city. We now welcome the opportunity to do much more. Highlight West and South Side lounges that offer blues and jazz as historic attractions, and promote to tourists, like in the 1970s and 80s. Encourage bus tours to areas remote from downtown. Connect city’s tourism website to existing blues forums such as Karen Murphy’s Chicago Blues News, on-line newsletter and calendar. Open up the annual Blues Fest and other city festivals to a wider group of performers, overcoming political favoritism suffocating artists’ careers. Make it easier for performing artists to sell and benefit from their own recordings. Make “Night out in the Parks” more artist-friendly with contracts that guarantee when the city is to pay artists. At city cultural, business and political events, feature various blues and soul acts. Bring the city together culturally; make it cool to have blues acts on programs with jazz, hip hop, R&B, rock and country. Advertise and encouarge other advertisers, encourage black and other radio stations to again program blues and soul music. This is Chicago! Facilitate a conference (the blues community can help! ); invite teaching artists, evaluators, critics and classroom teachers. Build on the work of Dr. Janice Monti’s 2008-12 Dominican Blues Symposia. Highlight the work of current blues educators, and discuss the needs, teaching methods and opportunities to implement blues education everywhere. Encourage all CPS and charter schools to offer basic music, including singing, instrument playing, theory and world music. Examine the CPS vendor criteria for teaching and performing artists; make it easy for a variety of blues acts, not just a few, to perform for school assemblies. Train teachers to use blues in everyday music, literature and history curricula. Encourage after-school band programs, coached by professional blues, gospel and jazz musicians. This will not just keep kids off the street; it will reconnect generations and ensure a future fan base for upcoming blues musicians. Have a traveling Chicago blues education booth at national and regional education and arts conferences. 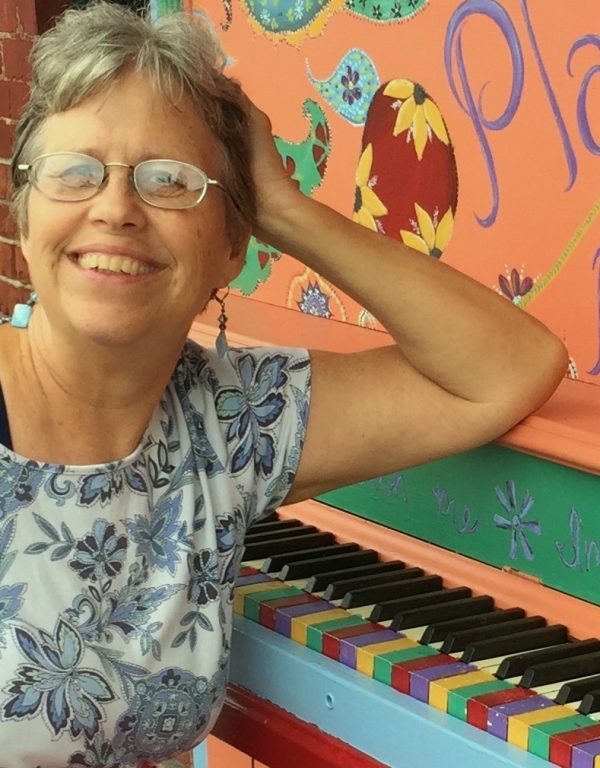 “Barrelhouse Bonni” McKeown is a journalist, blues piano player, teaching artist and citizen activist who presents and supports heritage musicians upholding the blues and soul tradition. Community development expert Valerie Leonard will be the guest speaker July 12 at Gone Again Travel & Tours, 5940 W. Chicago Ave., as residents continue to discuss how to use blues and soul to develop the West Side.